Hi friends! 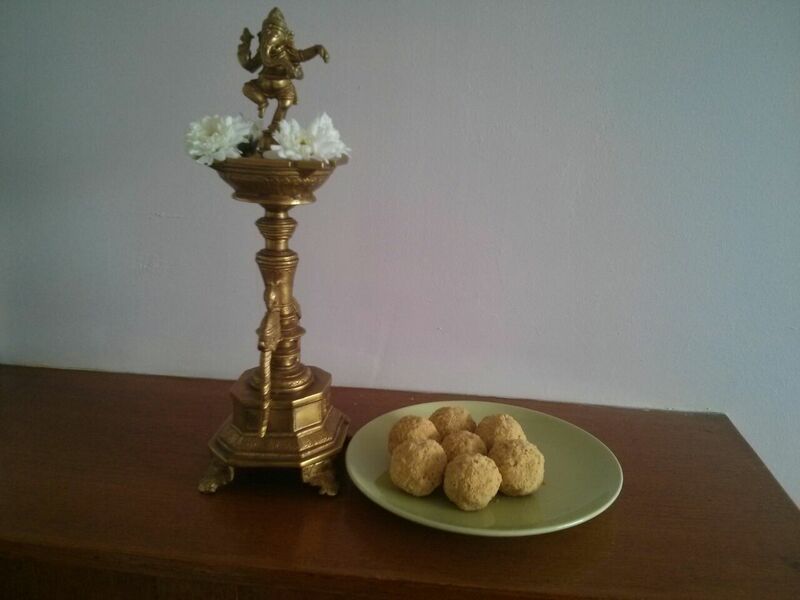 The Besan ladoo is a popular and very delicious traditional Indian snack/ Indian dessert in North India, made with gram flour, powdered sugar and ghee. In a kadhai / wok / heavy bottom pan, heat ghee. Add the besan/ gram flour to it. On medium flame, mix well and continuously stirring, fry the besan / gram flour till it gets fried well and has golden colour . When besan/ gram flour is well fried, take it off the heat. Gradually add powdered sugar, cardamom powder mixing constantly. Mix very well, cool the mixture to a bearable / handle able level and make( round) laddoos! Cool the laddoos before storing in a container. Makes 36 medium sized laddoos. Hi, I tried this for Ganesh Chaturthi today and the results were too good 😀 Thank you! Ganpati bappa morya!